I attended the full meeting of Ipswich Borough Council, where all 48 councillors should (but rarely all do) turn up for a good old political ding-dong. Local Government, and especially district councils like Ipswich, is terribly bloated with councils having probably double the number of staff they really need to do the basics: collect the rubbish from the kerbside and the litter from the street (although this is rarely done in residential areas if at all), tend to the parks, collect the business rates and do the only thing district councils have any real power over: processing planning applications. The rest of their activity on community cohesion, applying for Fairtrade town status, ensuring council house residents eat five pieces of fruit a day etc is merely done to keep people in non-jobs. When did government become a place for people who can’t get any meaningful productive work to spend their days? Anyway, this is why full council meetings are 80% pointless. Motions are put forward which boil down to an hour of hot air which achieve a big fat zero. Take the motion proposed by wannabe Labour MP David Ellesmere, Labour council leader and part-time software engineer on the rumoured closure of the Royal Mail sorting office on Commercial Road. 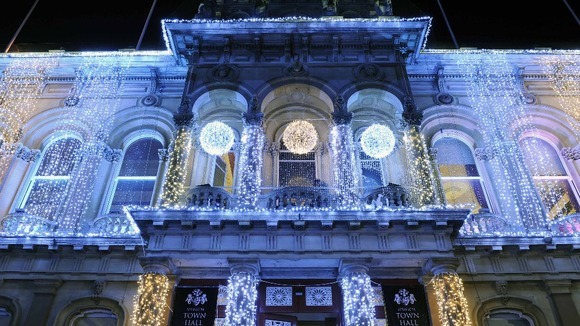 What power has Ipswich Borough Council got to stop it? That’s right, no power at all. Do you think Royal Mail even know a motion was proposed last night? Did they hear it? A few posties turned up but was anyone from Royal Mail management there taking note of this earnest motion. No. Most Royal Mail management wouldn’t even know when or where Ipswich Borough Council met or which political party was in charge. On a political note, Cllr Ellesmere’s motion backfired on him. He was hoping the Tories would be in favour of the sorting office closure. Not so. The Tory amendment presented by their leader Cllr John Carnall, went one further and said Ipswich should be the sorting office centre of East Anglia. The posties even clapped Tory John. When the motion ping-pong ball was batted back to the Labour leader he didn’t know what to do with himself. So he proceeded to tie himself in knots by saying he agreed with the Tory amendment but didn’t agree with it and he wanted Cllr Carnall to drop his amendment so Labour could adopt the Tory amendment and present it as their own amendment. Cllr Ellesmere made himself look like a little schoolboy who wanted to have the last word. The arithmetic at the council meant Cllr Carnall had little choice but to agree to Cllr Ellesmere’s childish plan. Then the meeting moved on to Council Questions. This is probably the only part of the gathering which has any meaning and benefit to the democratic process. It’s just a pity no one hears the questions and answers other than the councillors and two or three members of the public who normally turn up. This is why Ipswich Borough Council’s communications officers should pull their finger out and get on with web-casting council meetings to the wider Ipswich community. Questions about the height (they will each be 130 metres tall) of the proposed wind turbines at Thorington Hall were asked by A Riverside View blogger Kevin Algar to Cllr Sandy Martin, Portfolio Holder for Fairer and Greener Ipswich, who yet again dismissed the concerns of local residents over these monstrosities. Labour love wind farms so why bother standing up for the majority of residents who don’t: it is clear Labour will not represent local residents and in doing so are actively supporting the wind farm development by not standing in the way of energy firm Partnership for Renewables . There was also a question from Cllr Carnall on council tax for 2013/14 to finance chief Cllr Martin Cook. Cllr Cook refused to say whether council tax would increase. 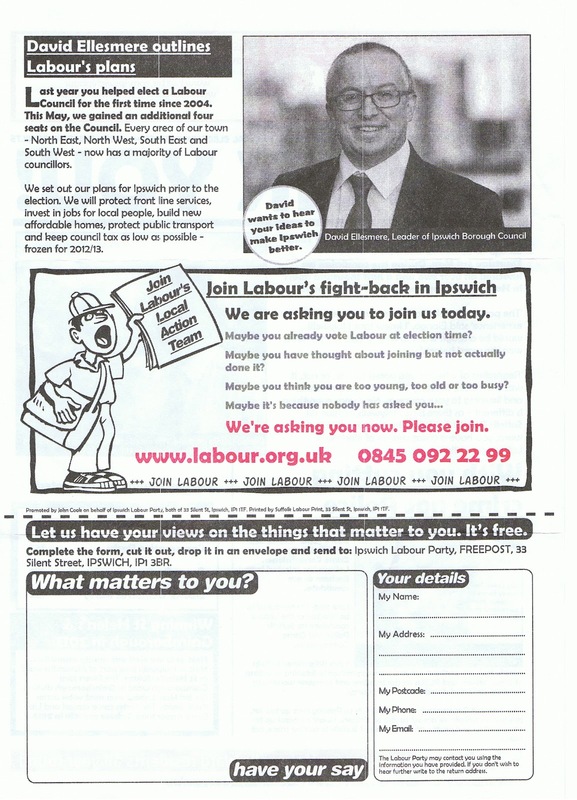 Labour have form in raising council tax rather than find savings so don’t be surprised if the Ipswich precept goes up in April. We also learnt at the meeting through a question from Cllr Robin Vickery that emergency repairs to County Hall, the former home of Suffolk County Council, are taking place. The site has been stood derelict since 2005 and is in a bad state. Its listed status and current financial climate seems to be delaying any development. And Cllr Judy Terry got out of culture chief Cllr Bryony Rudkin that the number of performances at council-owned The Regent theatre dropped in 2011. This is typical of Labour: they inherit a revitalised Regent theatre – masterminded by former culture chief Cllr Terry when the Conservatives and Liberal Democrats ran the council – and they begin to run it down the moment they get their hands on it. Just like the economy. Next up was a report on Council benefits and how from April 2013 local councils will be responsible for paying out discounts on council tax to those on low incomes from their own budgets as determined in the Welfare Reform Act 2012. The Coalition Government’s aim is to force councils to find savings in all that non-job stuff like five-a-day coordinators and segregating communities in the name of multiculturalism (didn’t they get the memo from David Cameron?) rather than see their low wage voters miss out on a council tax discount. This got socialist Cllr Keith Rawlingson very excited about people deserving hand-outs. He should try living in Eastern or Southern Europe where they wouldn’t know to laugh or cry if you told them how much taxpayer’s money was dished out to people to top up their salaries here in the UK. Despite all this fuming from Red Keith and for the record, Labour in Ipswich chose to hit people on low incomes rather than scrap pointless activity at Grafton House. The final business item was another motion, this time from Tory Cllr Richard Pope, the Shadow Housing Portfolio Holder. Cllr Pope proposed, in keeping with the Christmas spirit and saying thank you to Father Christmas for our presents, the council should ask the Chief Executive, Russell Williams, to write a thank you letter to the Government’s housing minister, Mark Prisk MP, congratulating the Government on their Housing Revenue Account reforms, which will allow local councils to keep more of the money they collect from council housing tenants. This money is being used by the current Labour administration in Ipswich to build new council houses. As amusing as the motion was it served no purpose other than a light political knock-about before the Christmas recess. Cllr Ellesmere questioned why Cllr Pope didn’t write his own thank you letter but instead wanted to get his “dad” to write it for him. A sound of bemusement spread through the council chamber. Was Russell Williams Cllr Pope’s father? This little quip from the Labour leader spoke volumes on how Labour councillors see officers as superior to them. Either that, or the chief executive is to tell Cllr Pope: “I am your father, Richard”. Categories: Cllr David Ellesmere, Cllr John Carnall, Cllr Judy Terry, Cllr Keith Rawlingson, Cllr Robin Vickery, Cllr Sandy Martin, Council Questions, council tax benefits, Ipswich Borough Council, Kevin Algar | Permalink. Apologies for not blogging lately but I have been out of the country on business and have had to spend an exorbitant amount of time working to pay my taxes to keep the Ipswich Labour Party in the comfort they are used to (despite their party causing the worst economic recession since the 1930s) to pay for the Indian Navy’s new warship and the new tourist attraction in Iceland. But I did manage to get to the meeting of all 48 (well, it would have been if they had all turned up) Ipswich Borough Councillors at the Town Hall on Wednesday evening last week. When I arrived, I did have a chuckle to myself when I saw the press gallery had been removed and the Morning Ipswich Star’s political editor Paul Geater had been forced to slum it with the ordinary voter and bloggers in the public gallery. Needless to say Mr Geater didn’t look impressed. The price of democracy, eh? As I wrote recently in the comments section of Ipswich Spy, the quality of minute taking at any meeting at the Council is woeful. If the minutes are to be believed, one would think we all turn up to the meeting, there is a prayer, the mayor tells us what a jolly good time they have had over the last six weeks, the councillors raise their hands seven times and then we all go home. Hardly Hansard. Fortunately, democracy is a bit more active in Ipswich but the actual goings-on at the town hall are only starting to be revealed after a number of local political blogs, including this one, started reporting proceedings over the last two or three years. Borough chief executive Russell Williams is to be congratulated for his excellent decision to make the reporting of council business more transparent. After the “non-denominational prayers” for “those with faith and those without” (seems like a contradiction in terms) and the Mayor’s Communications we moved on to a perverse announcement from Labour Mayor Mary Blake that a junior clerk was leaving the Council, which was bizarrely followed with gushing praise for this unelected bureaucrat – I was half expecting a standing ovation to follow. Look, I am all in favour of thanking someone when they have done a good job but what is it with councillors, especially Labour, falling over themselves to praise unelected civil servants in a public setting? You never hear, say, George Osborne, standing up in the House of Commons, listing all the Treasury mandarins who have helped him pull the budget together (that’s what their Whitehall managers are for). That’s because we live in a democracy and the person publicly responsible for anything the Government does in his portfolio is the politician. May be Labour just don’t understand democracy or perhaps they can’t distinguish between Labour councillors and Labour-supporting officers? Then to the business-end of the meeting and Council Questions. I’ll report on the key themes that came out of the questions to Labour Portfolio Holders. A hot topic at the moment are the roadworks in Fore Street, which are not being caused by the Travel Ipswich programme but by National Grid. A huge crater has opened up in Fore Street to fix the gas mains. The works have been going on for months and have overrun. Ipswich Borough Council – at least until April next year when the County Council take back control of the roads – are responsible for giving permission to contractors to dig up the road and for ensuring the utility works are completed in a timely manner. On the latter point, they have patently failed. Therefore, Conservative Cllr George Debman asked Labour transport chief Cllr Phil Smart why the Council were not being more proactive in bringing these roadworks to a close so local businesses can start to recover from the horrendous impact the works have had on their takings during the last six months. Instead of showing some leadership, Cllr Smart just passed the buck to National Grid and deployed the stock excuse for socialists: we can’t help businesses in the area because of “health and safety”. Tory Cllr Chris Stewart then asked a good question to economic decline development portfolio holder Cllr Carole Jones on what the Labour administration intended to do to further promote the town during the Ipswich Maritime Festival next year. Again, there was no rhetoric from Cllr Jones about her vision for developing the town’s economy through events like this and instead waffled on about the new Travelodge and Premier Inn hotels being available for visitors to stay at next year. Cllr Stewart in reply tried to help Cllr Jones by suggesting the marina water itself be used as a platform for promoting the town’s history and future. Cllr Stewart also made a good point about inviting the marine industry to attend the Maritime Festival and for civic leaders to bring businesses in this sector together during the event. Instead of welcoming his comments, Cllr Jones just snapped back that he should attend the Economic Working Group to raise these ideas. It later transpired in the meeting that Cllr Stewart is not on the Economic Working Group but he said he would be delighted to attend if the ruling Labour Party invited him! Conservative Group leader Cllr John Carnall followed with a stinging question to Cllr Smart on how Labour intended to spend the £140,000 earmarked in the budget for “public transport” and asked if the £140,000 which is Ipswich Buses’ pension deficit was just coincidentally the same figure? In typical form, Cllr Smart just side-stepped the question and said he wished the “bus war” (where First Group are legally competing with the inefficiently run Ipswich Buses) would end soon. Cllr Smart needs to be careful here: if Ipswich Borough Council were to use the money to fill the pension gap black hole this is likely to be illegal under the Transport Act 1985. Therefore, I’m glad to see the Tory Group have not forgotten this suspicious budget item from earlier this year. This blog will continue to watch how Labour spend this money like a hawk. Propping up Ipswich Buses’ pension pot with taxpayers’ money so the Labour council can satisfy an ideological need to own a bus company is not acceptable. Earlier this month, as reported on this blog, former Marks and Spencer boss Sir Stuart Rose attended the Ipswich Beacon Conference to advise the Borough Council on how to improve the town centre environment to attract more shoppers. 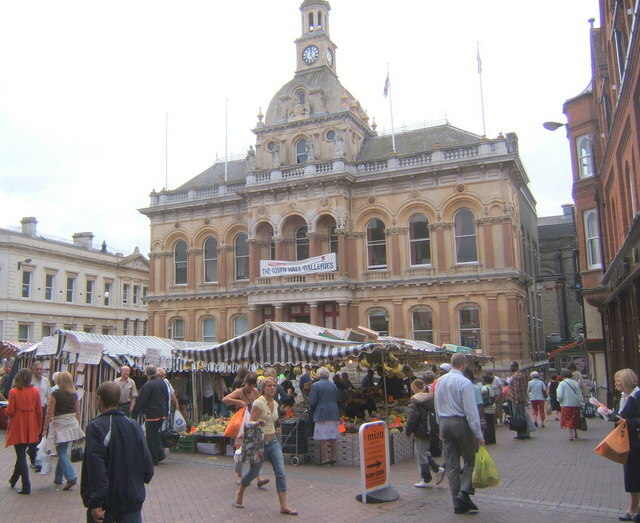 One of his key ideas to get more money into Ipswich is to remove the market from the Cornhill. He said it obviously should still trade but it would be better to move it down the soon to be pedestrianised Princes Street/Queens Street and up Lloyds Avenue, thereby freeing the only remaining large open space in the town centre. The Cornhill could then be transformed into an attractive focal point where a café al-fresco style culture could prosper in the same vein as Exchange Square in Manchester. After Sir Stuart’s speech at the business conference on 14th September, Labour council leader Cllr David Ellesmere sprung to his feet to tell the former M&S boss that this was a great idea and he would implement it immediately. Sir Stuart had not even managed to battle his way out of Ipswich before Socialist David Ellesmere had changed his mind and the market again became a sacred cow that just could not be sacrificed for the greater good of Ipswich. Weak leadership of the highest order! This predictable volte-face, reported by Ipswich Spy a couple of weeks ago, was confirmed at the Council meeting on Wednesday when Cllr Ellesmere answered a question from Cllr Carnall asking him to confirm the plans for the market. Cllr Ellesmere, instead of reiterating his praise for Sir Stuart’s vision, as he had done only a few weeks before at the Beacon Conference, instead said he thought Ipswich Market’s location was a positive to the economy and that retail guru Mary Portas agreed with him. What he failed to mention is Mary Portas had praised a market in another town which was not cluttering up the only free public space left in Ipswich’s town centre. I think Cllr Ellesmere’s back-pedalling might have more to do with the fact the Labour Party receives funding from the market traders through their union subscriptions!! Labour ideology is to ensure their own friends come before the greater good of the town. This neatly takes us on to the main report of the evening, which was on councillor allowances. 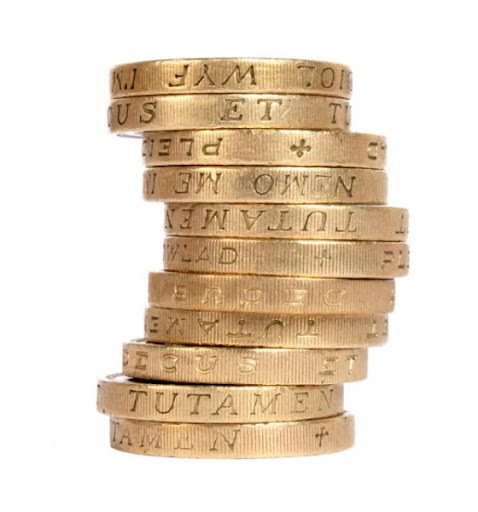 The Council had ordered a report from an Independent Remuneration Panel on councillors’ basic and special responsibility allowances. The report was ably presented by panel chairman Mrs Sally Wainman, a retired nurse who, when she is not campaigning for Broomhill Pool, now writes at the Ipswich Spy parish. The panel recommended the overall allowances budget should not rise but basic allowances – which are some of the lowest out of any council in the country – should be increased to bring them more in line with other local authorities and to reflect better the hours backbench councillors put into their roles. A backbench councillor receives £3,745 a year. Some back-bench councillors are working 30 hours a week attending meeting and dealing with case work in their ward. A junior civil servant will be earning SIX times as much for doing similar hours but councillors are the most senior people in the Council. 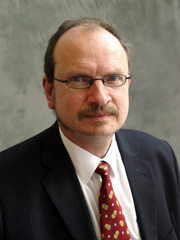 Tory frontbencher Cllr Richard Pope said he had calculated he earned £3.75 a day after tax as a councillor. He said: “I don’t know about everyone else but I have come straight from work and £3.75 wouldn’t even buy me dinner in one of the fast food establishments of Ipswich.”. Quite. Anyone who says a councillor is doing it for the money is either mad or bad. But there are some who say we are equal, but some are more equal than others. Cue the Labour Party. When they took back control of the Borough in May 2011, they immediately gave special responsibility allowances to five of their backbenchers by creating five new chairmanships when they replaced the Area Forums with Area Committees. The Area Committee chairmen – all Labour councillors – chair a formal public meeting a few times a year to discuss community issues in their respective area of Ipswich, of which there are five: North West, North East, South East, South West and Central. The meetings were initially to be held in Grafton House which has security doors and guards and is difficult to access by the public (may be that was the point?) but after an outcry from opposition councillors the meetings were moved into the community, such as school halls. At the time these new chairman roles were created, Labour leader Cllr Ellesmere promised at a Town Hall meeting their allowances would be decided by an Independent Remuneration Panel. Well, that Panel has now reported and recommended the Area Committee Chairman allowance be reduced to pay for a rise in the basic allowance. But has Cllr Ellesmere accepted this. No. The Panel’s recommendations would be cost neutral – i.e. the taxpayer would not have to cough up a penny more. The Tory Group voiced their favour for the recommendations, even if there were holier than thou moments, especially when Cllr Debman said he would give any increase to the hospice. But contrast this with Labour’s Cllr Ellesmere who shot the Panel’s report down in flames, accusing Mrs Wainman and her colleagues of not understanding the role of Area Committee Chairmen and stating the Labour Group would not be voting for the recommendations and instead would INCREASE the councillor allowances budget to ensure his Labour backbenchers continued to pocket an additional £3,745 a year on top of their basic allowance of £3,745. This means 18 out of Labour’s 32 councillors receive £7,490 a year – over half their Party. The allowance is hardly “special” any more, or may be just special for Labour. The amount of money, in this instance, is not the issue (no one should work for free), it is the hypocrisy of Labour: on the one hand they deplore basic allowance increases and then on the other hand they vote the majority of their members a nice little increase, whilst the opposition Conservative and Liberal Democrat councillors are not awarded a penny more. This is a sign of classic socialism: ensure the party hierarchy get their money and then pull the ladder up to stop the general population from benefiting the same way. And guess who foots the bill for this socialist ideology – yes, you and me as the taxpayer. If you don’t like socialism, never vote Labour. And neither did the Liberal Democrats come out of the allowances debate smelling like a bed of roses. One of the recommendations was to get rid of the special responsibility allowance for the leader of the Liberal Democrats, who now only have four councillors with even less expected to be returned at the next Borough Elections in 2014. This sparked Liberal Democrat leader, Cllr Inga Lockington, into life (after arriving late because she was attending the Liberal Democrats conference in Brighton) making a passionate plea to keep her extra cash. But when it came to the vote on the Panel’s recommendations, the only two Lib Dem members who could be bothered to attend Wednesday’s meeting abstained! This rightly triggered groans of derision for the yellow peril. A sombre moment in the meeting then arrived with the presentation of the report on the Armed Forces Community Covenant, which local councils across the country are being encouraged by central government to sign up to as a statement of mutual support between the civilian community and its local people who serve in the Armed Forces. Ipswich Borough Council have a good track record on this. The Borough has been demonstrating their support for our Armed Forces, not just in thoughts but deeds, for some time and were in fact spurred into action by Tory Group leader Cllr John Carnall last year when he suggested the council provide free leisure passes (I-cards) to members of the armed forces who live in Ipswich. This allows soldiers, airmen and sailors to use the council-owned swimming pool and gyms for free when they are not on a tour of duty, including in Afghanistan. The Conservative Group continued to give their full support by backing the signing of the Covenant at the Council meeting. Labour’s Cllr Alasdair Ross, who has served in Afghanistan as an Operations Warrant Officer with 2 Rifles, made a moving speech supporting our Armed Forces and the work they do defending our country. The speech was non-partisan to the point Cllr Ross even praised Cllr Carnall for his motion last year to give free I-cards to armed forces personnel in Ipswich. As Cllr Ross said, the Borough have subsequently gone further and provided free tickets to shows at the The Regent theatre. Cllr Ross also eloquently highlighted that the headlines may focus on the tragic deaths but British soldiers in Afghanistan are also being badly wounded in double-digit figures every day, some losing limbs. 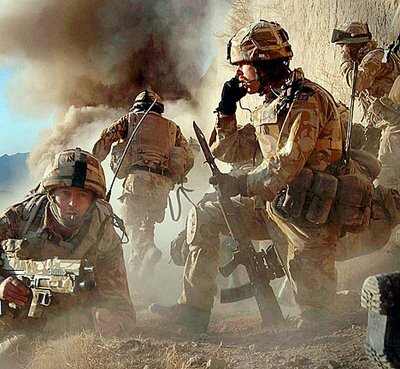 The sooner we get out of Afghanistan the better – why we are there, I do not know. Cllr Inga Lockington of the Liberal Democrats also pressed for the Norfolk and Suffolk Mental Health Trust to sign the Armed Forces Community Covenant as well as the NHS Primary Care Trust. This was a powerful point because, as Cllr Ross stated in his speech, mental health issues are very prevalent amongst former members of the armed forces: more men who served in the Falklands War have committed suicide than died in combat. The same statistics are true for the ongoing Afghanistan conflict as well. In response, Labour leader Cllr Ellesmere said he would work to ensure the local Mental Health Trust were are also signatories to the Covenant. The report was voted for unanimously. After this serious and constructive item, the Council meeting then descended into farce. I was almost late to the meeting because of the roadworks which have begun as part of the £21 million Travel Ipswich project. And as the roadworks get started in earnest, for reasons unbeknown to anyone other than himself, Tory Group leader Cllr John Carnall decided to put forward a motion supporting the current transport works and thereby linking the Conservative Party with the traffic chaos which will be experienced by all who live and work in Ipswich over the next twelve months. That’s going to help bring the votes in at the County Elections next year isn’t it? It also doesn’t help that the Travel Ipswich project is a deliberate central government policy to reduce traffic volumes in Ipswich town centre by creating a road network which causes more congestion thereby hoping people will take the bus or cycle. This is supposedly to mitigate against non-existent anthropomorphic climate change. The problem is public transport in Ipswich is piecemeal, commensurately expensive and regularly late. In other words, making it harder for people to drive into the town will not see a shift to public transport use: it will just make it even harder for people to drive into Ipswich and spend money in our shops. To the extent they will travel to Norwich or Cambridge instead. Hardly, the best plan of action to help our struggling economy. It is unsurprising Sir Stuart Rose said Ipswich should make it easier for drivers to come into the town centre: this is a man who gets business unlike Suffolk County Council. The Tory motion slipped in a commendation for Ipswich MPs Ben Gummer and Dr Dan Poulter (whose constituency also encompasses North West Ipswich) for securing the £21 million funding. All true, but again why try and link the Conservatives with mass roadworks and a scientifically flawed “green” policy? Labour have a huge majority on the Council and they predictably crushed the Tory motion. Was it really necessary Cllr Carnall? No one outside of the Council chamber heard the praise for our Conservative MPs. And after you take the mainstream media, bloggers and the Independent Remuneration Panel out of the room there were only two or three members of the public present. It would have been far better to wait for the works to be complete, hope they are a success and then bask in the glory. If the Conservatives are to ever win back power at the Borough Council, they have to do much much better than this. Categories: Cllr Alasdair Ross, Cllr Carole Jones, Cllr Chris Stewart, Cllr David Ellesmere, Cllr John Carnall, councillor allowances, Ipswich, Ipswich Borough Council, market, Morning (Ipswich Star), Sir Stuart Rose | Permalink. Today the second Beacon Town Conference is taking place in Ipswich at the Corn Exchange. The conference is organised by the Morning Ipswich Star and brings together local business leaders and politicians to discuss how to improve the economy of Suffolk’s county town. This time round Ipswich MP Ben Gummer has managed to persuade the former boss of Marks & Spencers, Sir Stuart Rose, to attend the conference as a keynote speaker to offer his thoughts on how Ipswich can improve its retail offering. The conference delegates will also discuss how to get their hands on £24 Million of the government’s Future Cities fund. Earlier in the week during the Star’s promotion of the conference, I noted how Ipswich Borough Council leader David Ellesmere tried to hold on to Mr Gummer’s coattails when he was quoted in the local paper saying it was a “real coup for the town” getting Sir Stuart to attend the event. The fact of the matter is that without an MP like Ben Gummer who has connections far and wide through the family business of politics, Cllr Ellesmere would never be able to attract the likes of Sir Stuart Rose to come and speak at a provincial town business conference. But the Council can’t rely on the MP to develop Ipswich’s economy. That is not the MP’s job. Ben Gummer is tasked with representing Ipswich in Westminster and bending the ear of ministers and mandarins in Whitehall to get the best deal for Ipswich people. However, the political local leadership must come from the local authorities who are at the coal-face in the town day-in, day-out. Council leaders must be the primary drivers of change and development. This is where we are distinctly lacking in Ipswich. We don’t have such a leader. Borough chief executive James Hehir, before his untimely death, came close but he was a civil servant and should never have had to step into the shoes of a political leader. But he had to because no political council leader was a-coming. Ipswich has many things going for it, including a shopping centre which is actually quite good with a wide variety of retailers, the largest UK base for Willis insurance brokers outside of London and Europe’s largest research and development centre on its doorstep: BT Adastral Park in Martlesham. And even with dreadful rail infrastructure and chronic overcrowding, Central London is one hour, fifteen minutes away. But more must be done to develop Ipswich fit for the twenty first century: there are very few big private employers with public sector employment heavily relied upon which in the present “cuts” environment is not good for the local economy’s medium to long term health. And the transport links are more akin to the Victorian age rather the Digital age. Things can be better but it requires local political leadership from Ipswich Borough Council. At the moment we have a Labour council leader and a Labour Administration who yearn for the 1970s, who are rabidly anti-enterprise and anti-aspiration. Cllr Ellesmere fits the bill of a old-style Labour leader – he has everything other than the donkey jacket. Is central government really going to part with £24 Million with this man? For Ipswich to move forward to the next level, we need a dynamic leader who gets economics, aspiration and growth. Frankly, it doesn’t matter how many high profile retailers, entrepreneurs and other successful leaders appear at provincial town business conferences if, when the keynote speakers go home back to the home counties, there is no one left back in Ipswich who can absorb the ideas and then lead a team to implement them. Don’t look at Ben Gummer to do the Council leader’s role. The MP is doing his bit: ministers and Whitehall mandarins know for the first time in twenty years where Ipswich actually is on a map. Our health services at Ipswich Hospital and our schools have directly benefited as a result of Mr Gummer’s work representing the town in Westminster. But that isn’t enough if we are to attract investment to Ipswich. Without a go-getting council leader, Ipswich will only ride the economic wave rather than chart a successful course. We are certainly not seeing any spark or vision from the current Labour administration and leader. Even before they got their hands back on the levers of power in 2011 they colluded to turn their backs on 900 jobs and £70 Million of investment when they voted against Tesco’s proposed development of the old B&Q site on Grafton Way. Then once they were in power they continued their anti-enterprise agenda by voting against the conversion of a closed Green King pub site on Woodbridge Road into a new retail unit with new jobs. Labour’s campaign slogan should be: “Against jobs and investment”. It is not as if Labour can’t deliver growth and prosperity to a town: look at Reading in Berkshire, a town not so dissimilar to our own. The electorate consistently vote a Labour administration into their council but here the Labour councillors actually showed some leadership back in the 1990s and attracted millions of pounds of investment to turn what was a run-down dump of a town centre into one of the best retail environments in the country with The Oracle Centre. Their can-do attitude and strong leadership undoubtedly also attracted some of the biggest IT firms in the world – Microsoft, Oracle, Cisco etc. – to setup shop on the town’s periphery. Ipswich PLP take note! Back in Ipswich, the Borough Labour leader might not have a donkey jacket but the similarities with Michael Foot are there for all to see. The sad thing for Ipswich is I think Cllr Ellesmere might quite enjoy the comparison. 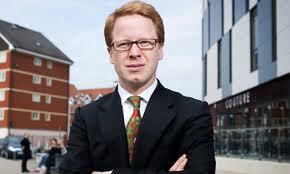 Categories: Ben Gummer, Cllr David Ellesmere, Ipswich, Labour, Morning (Ipswich Star), Reading, Sir Stuart Rose | Permalink. The default Thank You leaflets, post the local elections in May, have landed on my doorstep in the last few weeks from Labour and the Conservatives. Guess the Liberal Democrats aren’t very thankful. 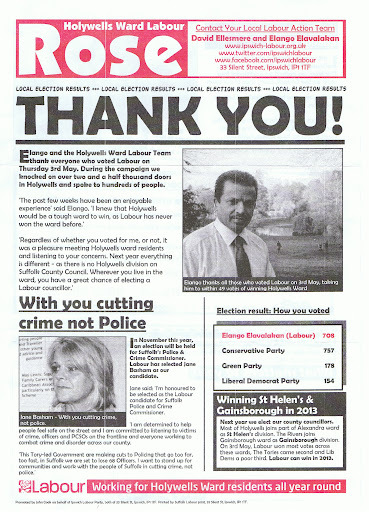 The most noticeable thing from the Labour Thank You is Labour Ipswich parliamentary candidate David Ellesmere has muscled in on the local Holywells leaflet. A bit strange since his party’s candidate lost in Holywells. I guess the old adage that “all publicity is good publicity” has been taken on-board at Silent Street. The leaflet also plugs serial public money spender Jane Basham, who will be Labour’s candidate for the new Police and Crime Commissioner post in the November elections. Labour are also eyeing up the County Elections next year. With the way the votes fell in the Borough elections, they do have a good chance of mopping up a number of Tory-held seats in Ipswich. With the rise of UKIP in the shires, it could turn out to be a very interesting election in May. The Conservative Thank You actually focuses on the candidate who won, Pam Stewart. I like that the Tories are focusing on my pet issue, that of the unpaved dirt track between Gladstone Road and Foxhall Road which my Committee approved for paving nearly three years ago. I hope new Cllr Pam Stewart will keep the pressure on officers from within Grafton House. This blog certainly will be from outside once the new consultation deadline expires on 29th June. 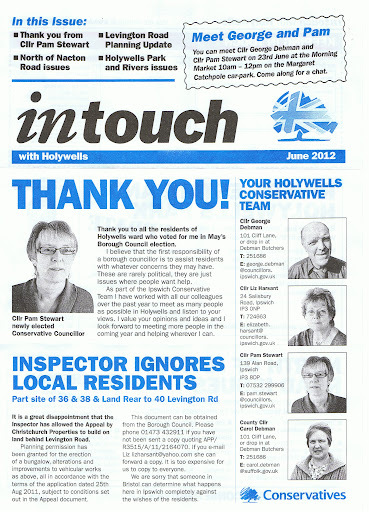 There is a strange piece on the back-page which highlights the low turnout in Holywells Ward. It comes across as if the Conservatives are telling the electorate off for not voting! As in “tut, tut, why didn’t you vote?” I’m not sure that is the best way of enticing people to the polling station. Also, if a party is to encourage postal voting, the best thing is to ask them to contact the party for a form not ask them to visit a website with no address! There is no promotion for the Conservative Police and Crime Commissioner post as the Tories are yet to select their Suffolk candidate. Both Labour and the Conservatives make good use of their leaflets to drum up membership and activist support. The Conservatives seem to have multiple addresses with 24 Salisbury Road being used as a postbox for Holywells mail, the imprint (i.e. legal address) being in Valley Road and the MP’s address being in Fore Street. I understand the reasoning when you rely on volunteers and don’t have a full-time agent, but it’s still a bit confusing to a lay-man. Meanwhile, Labour have one address: their Silent Street office in town. 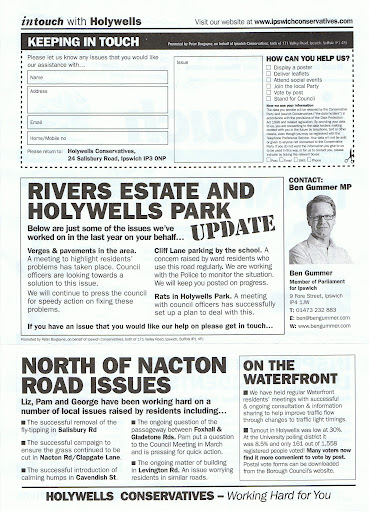 For my fellow political geeks, I’ve uploaded both leaflets to ElectionLeaflets.org here and here. Categories: Cllr David Ellesmere, Cllr Pam Stewart, Ipswich Borough Council, Local Elections, Police and Crime Commissioner | Permalink. The last gathering of all 48 councillors of Ipswich Borough Council before the local elections was a short affair. There is never a full year of Council meetings in local government because of something called purdah, which basically means elected councillors can’t be seen to be influencing the bureaucrats at the council during the election campaign period, which runs from now until 3rd May. It’s another way for Sir Humphrey to really run the show. The first question was to Labour’s transport chief, Cllr Phil Smart, from Cllr Nadia Cenci of Stoke Park ward. She queried the service performance of Ipswich Buses on the route from the town centre to Asda supermarket in her ward. A simple enough question but one which Cllr Smart managed to overly complicate by feigning confusion about which route Cllr Cenci was referring to and then he proceeded to mumble about performance statistics. Somewhere in his answer was the obligatory Labour line that “Ipswich Buses are brilliant” and how they were the “most reliable operator”. He didn’t say if their pension fund was going to be propped up by Ipswich taxpayers – I guess we’ll have to wait for that denial or confirmation another time. Portfolio Holder for Economic Decline Development, Cllr Jones, then received a question about the derelict former Kwik-Fit garage site at St Margaret’s Green from Tory leader Cllr Carnall. He asked what the Council was doing to encourage development on this eyesore. Cllr Jones waffled on about the owner being out of the country, that the Labour dominated Planning Committee had turned down a car washing venture on the site and that local residents had told her they wanted to take over the site and turn it into a “little park”. Ah, how nice. And who will pay for this? Cllr Carnall then asked another question to Labour’s Economic Decline Development chief about empty shops in the town centre. Cllr Jones said there were few empty units that remained empty, which to be fair is true. I am big advocate of Ipswich town centre and do not see the doom and gloom said about the high street from local people. As I’ve said before, some northern cities would cut their right arm off to have a town centre like we have. But then Cllr Jones entered her little fantasy world again and suggested her Economic Development team at the Council had negotiated the sale of the privately owned Tower Ramparts shopping centre and that they had single-handedly filled empty shop units with the likes of the shoe shop Office and the Apple electronics iStore. She really needs to get a grip on reality: the Economic Development department may have promoted the empty units (but the Overview & Scrutiny Committee found they were not very good at that during our analysis in 2010/11) but they certainly did not ensure they were filled – that was very much the result of the private market and investors only. If the Economic Decline Development Portfolio Holder really wants to encourage investment into our town she should encourage the Labour dominated Planning Committee to give permission to private companies to set up shop in Ipswich, for instance on the Golden Key public house site. Cllr Judy Terry then asked a question to Labour leader Cllr Ellesmere on what value his Administration puts on the Council’s policy on Consultation. Cllr Ellesmere took the opportunity to read extracts from Cllr Terry’s maiden speech to the council back in 2004 when she said: “…the council should get on with things, not consult.” Very well put Cllr Terry. What is the point of electing councillors to make decisions on behalf of residents if they then just pass the buck back to them? That’s not called leadership. Next up was Holywells candidate Pam Stewart who asked two questions to Cllr Phil Smart about the topic which interests this parish greatly: the Gladstone Road/Foxhall Road footpath scheme (approved by councillors nearly three years ago!). 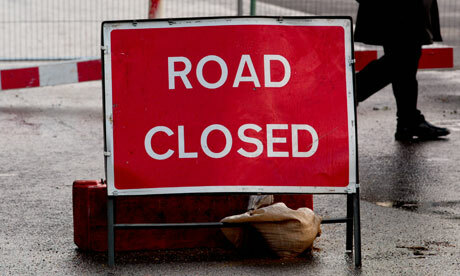 Mrs Stewart asked a somewhat technical question on if “Section 26 of the Highways Act 1980” had been complied with. I am not sure this was the best way of confronting the incompetence and delay of Ipswich Borough Council on this issue – I would have probably asked what the council had been doing since August 2009 when the decision was made by councillors for the footpath creation order to go ahead, but we all have our own styles. Predictably, Cllr Smart said “Yes” to Mrs Stewart’s answer. Mrs Stewart’s second question was far better when she asked: “When will the process be completed and the path surfaced?”. Cllr Smart shuffled on his feet and and mumbled that the order “had been sealed” and that the next milestone was 19th April when the deadline is reached for any objections to the footpath being created. But then Cllr Smart pretty much summed up this saga when he said if there were objections the process could become “very elongated”, as if it hadn’t been already! The only reason the order for the footpath has been issued and advertised is because myself and Cllr Harsant have been pushing for action from the faceless bureaucrats in Grafton House. Sir Humphrey really is in charge. One of the successes of the Coalition Government is the Localism Act which, amongst many measures, forces Councils to reveal how much they pay their senior staff. This was actually the policy of the former Conservative-led Council before the Localism Act received royal assent but the law has now forced Labour to continue with the policy and reveal what their chums are paid at Grafton House. The headline is Russell Williams, the Chief Executive, is paid tens times the lowest paid member of staff, which is a pretty good ratio. And as Cllr Carnall said: “Ipswich Borough Council is not one of those councils that pays their CEO more than the Prime Minister!”. Cllr David Ball took the unusual step for a Labour politician and stood up to criticise the writing of the Pay Policy report. To be fair the report was a bit of a shambles with officers lazily duplicating text throughout the document to pad it out and not summarising the content of the report correctly on the front sheet. Socialist Cllr Sandy Martin shot up to defend his friends in the civil service and said they were doing a great job on a low wage. Well if £60,000 a year isn’t enough to ensure a report is written correctly, I am in the wrong job! The report was voted for by all councillors. 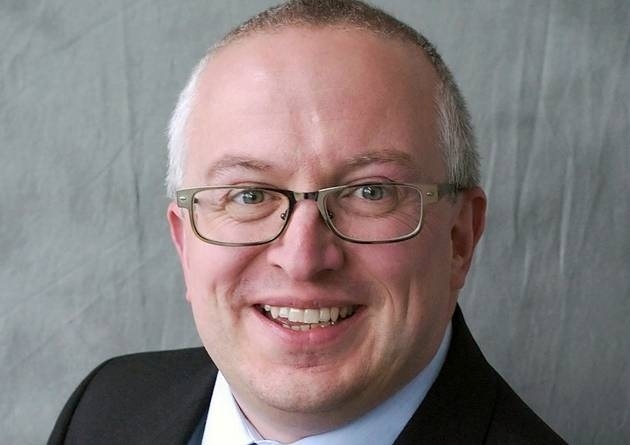 Labour’s Finance chief Cllr Martin Cook presented a report which said contractors must not bully or harass employees of Ipswich Borough Council. Fair enough. But I have to say, from my experience, an employee’s knee jerk reaction is to say they are being bullied if a manager tells them they need to improve their performance. But Labour love a policy that keeps people in work but not actually working. This was a report that shows you how peaceful and prosperous Great Britain is that councils are allowed to bid to become Heart Towns to promote healthy living. This is up there with employing five-a-day coordinators. It’s jobs for the public sector boys and girls to get paid to fill out out paperwork so the council can say we are a heart town, whatever that is. The Liberal Democrats chose the Ipswich Heart Town report to advocate the banning of everything: cigarettes, alcohol, fun etc. I wish we could ban the Yellow Peril. For what it is worth, the report was voted for by all councillors. It was difficult to tell though, as some voting intentions were little more than raising the index finger off the desk a couple of centimetres. Labour Mayor Cllr John Le Grys, wearing a scarlet red waistcoat just in case his political allegiance had gone unnoticed (chance would be a fine thing), thanked councillors who would be stepping down this year. There are only a handful but he couldn’t be bothered to name them. My wife is one of them so well done to her for serving her constituents for four years – longer than most people spend in one job! Categories: Cllr Alasdair Ross, Cllr Carole Jones, Cllr David Ball, Cllr David Ellesmere, Cllr John Carnall, Cllr Judy Terry, Cllr Martin Cook, Council Questions, Fabrice Muamba, Ipswich Borough Council, Pam Stewart | Permalink. Budget day took place in Ipswich on Wednesday this week, also a leap day, which led to strange goings on in the Council chamber. Firstly, in Council Questions, Cllr Kym Stroet accused Cllr Jones of being a “scandalous” woman because she was a Labour and Co-operative councillor (fair enough) and because she lived with Labour leader Cllr David Ellesmere, which meant she had a vested interest in her campaign to prevent Tesco from taking over the Greene King pub on Woodbridge Road. The theory being Cllr Jones was a protector of the Co-op supermarket but it was unclear what her co-habitation arrangements had to do with this. Cllr Jones retorted she was not “scandalous” and promptly sat down. We then had a couple of questions from Cllr Debman about snow clearance outside residents’ homes and shops in the town centre. Considering we had double figure temperatures outside that evening this was a somewhat surreal set of questions. But Cllr Debman did have a point when he said residents were fearful of keeping the pavement outside their house clear of snow for fear of being sued. Cllr Phil Smart, Transport portfolio holder, said residents should fear not and he would ensure an article was put in The Angle (the council’s propaganda sheet) in time for next winter. Cllr Carnall kicked off a theme which ran throughout the meeting: jobs and investment and Labour’s hypocrisy. The Tory leader asked Cllr Jones, Labour’s economic spokesman, what she was going to do to make the town centre more welcoming. She listed off numerous schemes, all of which either Ipswich Central (the town centre management company) or the previous Conservative-led administration had done, and tried to carry them off as Labour initiatives. Cllr Carnall reminded her the only thing Labour had done over the last few years was to oppose a major new £70M development on Grafton Way which will create 900 jobs. Following a planted question from leading Labour backbencher Cllr Alasdair Ross about the Benefits service, which, naturally, Labour’s finance chief Cllr Cook answered by stating how wonderful the performance of the Benefits service now was under Labour, Cllr Carnall asked another question about how the Council was getting on with re-cooping the £5M invested in Icelandic banks which went bust in 2008. The answer was around 90% of the money will be returned, which Cllr Carnall reminded the chamber ran contrary to Labour’s manifesto at the last Borough elections which said the evil Tories had lost all of the money. Nevertheless it is another example of how the taxpayer is suffering in the worst recession in modern times. Cllr Smart was given a kick up the backside by Cllr Tanya Maclure on the late issuing of orders for yellow lines, parking restrictions and the like. She also encouraged Cllr Smart to get on with the verge improvement works in Goring Road which were approved by the Community Improvements Committee over a year ago. Next up was the Housing Revenue Account (HRA) Business Plan which was presented to the council for consideration with any comments being taken on-board by the Executive Committee who will make the final decision on the business plan when they next meet. The HRA is basically a pot of money used to administer council housing and receive rents from council tenants. It is a complicated financial arrangement which under the last Labour Government saw £7M a year being syphoned off to central government for re-distribution amongst Labour heartlands in the north of England. The new coalition government has now stopped this arrangement. Cllr Mowles, Labour’s housing portfolio holder, also announced Ipswich Borough Council was going back in time and was intending to build council houses again. Although they would love to build council houses at any time as it is another way of keeping their voters in their place (quite literally) it has also become necessary because Labour’s John Prescott presided over the lowest number of houses being built between 1997 and 2007 since the 1920s. This directly contributed to the housing bubble which means a whole generation of young people cannot afford a home of their own. Just what the socialists want, of course. Cllr Carnall quipped during the HRA Business Plan debate that there was no mention of re-instating Ipswich’s Area Housing Offices despite Labour saying in the last election they were “indispensable” after the Conservative-led administration closed the inefficient offices down. Perversely, Cllr Mowles during the debate said he “apologised for raising political terms in this chamber” before he proceeded to say “Labour party”. If you can’t use political terms in a local government council chamber where can you? A very surreal leap day moment! Then we moved on to the Corporate Plan (keep awake at the back!). This is the strategy document which sets out what the council will be doing over the next five years. It is stacked full of waffle about bringing in jobs and investment (although Labour vote against any new jobs or investment) and how Ipswich will be looking to benefit from the Olympics legacy. Basically, the corporate plan is a waste of time – it is a typical New Labour document from a by-gone era when councils were encouraged to do everything for their residents and which has created the client state with millions of people dependent on state handouts to live. As Liberal Democrat Cllr Atkins put it succinctly, the council should be providing the basics like emptying the bins and mowing the park lawns and should forget about everything else like ensuring people eat five pieces of fruit a day and looking for non-existent community tensions – because the Socialists can’t afford such luxuries any more. Remember, there is no money left! Next up was the business end of the meeting: the Budget. May be it was the leap day effect but more likely it was because of Cllr Ellesmere’s ego which meant he presented the budget rather than Finance Portfolio Holder Cllr Martin Cook. Oh, and may be it was because Cllr Ellesmere is the Labour parliamentary candidate as well! One thing which struck me immediately was how bad Labour councillors are at speaking and presenting: they don’t even try to be coherent but instead mumble on about evil “Tory government cuts” and how their budget was for jobs and investment, despite Labour voting against 900 jobs and £70M investment in Ipswich only very recently. Contrast this with Cllr Carnall’s Chancellor of Exchequer style budget speeches over the last seven years. There are basically two things in the Budget: Council tax will be frozen this year helped by a coalition central government grant and the socialists will be spending investing £1.5M in new jobs and skills development. Labour failed to explain how they will magically create new jobs in Ipswich apart from appointing an Equalities Officer at Ipswich Borough Council to tackle bullying and harassment at the council. From my experience in line management, bullying and harassment is something that mysteriously starts being reported when an employee is told to pull their socks up and do a better job. As Ben Gummer recently said in his Morning Ipswich Star column (not online), it would be far better if the council gave residents a tax cut which they would spend in the local economy and in turn would fuel more jobs and investment. It’s called capitalism. But of course socialists would rather create a bunch of non-jobs tasked with inventing claims of bullying and harassment. It’s like a George Orwell novel. The Conservatives proposed a 3% tax cut in their response to Labour’s budget, which would pump £400,000 immediately into the Ipswich economy. This would be funded by getting rid of a redundant director (may be the one who never speaks!) and not bailing out Ipswich Buses’ pension fund to the tune of £140,000 (which is probably illegal), transferring the HEARS service to Suffolk County Council who are better placed to deliver an Adult and Social Care service and not recruiting the Stasi Equalities officer. Tory leader Cllr Carnall, when opposing Labour’s wasteful budget, revealed the Labour administration also planned to let Ipswich Town Football Club off the hook by allowing them to not pay an interest bill of £17,500 on the debt they own the council for unpaid land rent. The Conservative Budget Amendment was voted on, with all Conservatives For, Labour Against and the yellow peril abstaining. Paul Geater from the Morning Ipswich Star then left the press benches in the chamber without waiting to see if Labour’s budget was passed by the Council! Before the vote, Cllr Maclure interjected in the debate and raised again the issue of the Labour council setting money aside for Ipswich Buses. She, rightly, accused them of being disingenuous by not stating what the money was going to be used for. The council is legally allowed to subsidise bus routes if there is a community need but Labour had not stated in the Budget they intended to spend the money on subsidised routes but instead put the money under the header ‘Support to public transport in the Town’. This led Cllr Maclure and the Conservative Group to suspect the money was going to be used to prop up Ipswich Buses pension contributions. Something which Cllr Smart did not deny. If Labour were to do this it would be for purely ideologically reasons: they see Ipswich Buses as a means to control the masses (their voters) and it must be protected at all costs. The problem is there is legislation preventing a council from running a bus company, they can only own it and operationally it must be kept at “arms-length”. Competition Law may also prevent a council from subsidising a bus company’s pension scheme as this would give Ipswich Buses an unfair advantage in the bus transport market (all bus companies would surely then ask why their pension scheme cannot be propped up by the taxpayer?). If Ipswich Buses is run so inefficiently it cannot service its pension scheme then surely it should go bust allowing a more efficient bus operator to take over the routes. Ipswich Buses is not the Labour party’s play thing: fair competition must take precedent to protect taxpayers and the passengers. This one will rear its head again I am sure. Finally, the budget vote was held: Labour were For, the Conservatives finally voted Against something and, of course, the Yellow Peril Liberal Democrats abstained. The Council was asked by acting returning officer and chief executive Russell Williams to note the changes to the polling districts. The Council gave Mr Williams delegated powers to make these changes as Councillors themselves are not allowed to be decision makers in the way Elections are run by the Council, for obvious reasons. One of the changes is in my former ward, Bixley, where the Broke Hall Primary School polling station is going to be closed and residents will instead be asked to travel to Copleston High School to vote, which is a fair walk from the Broke Hall estate. Cllr Kym Stroet, who represents my old seat, spoke against the proposal but the Council still “noted” the decisions made. To Cllr Stroet’s credit he voted Against the proposals and asked for his vote to be formerly noted. Labour Mayor Cllr John Le Grys doesn’t even try to be non-partisan as the Mayor’s role is meant to be. One case of bias was obvious when the allotted time for each speaker expired. When Cllr Carnall was speaking in the Budget debate he ran out of the time and immediately the Mayor started manically pressing on his microphone button so all we could hear was ding, ding, ding as the mad Mayor tried to stop the Tory leader from speaking. Of course, it was a different story when Labour leader Cllr Ellesmere ran out of time. The Labour mayor just laid back in his chair and continued to chortle at the Labour leader’s bad jokes and even allowed Cllr Ellesmere to cross the chamber floor and slam a handful of 5ps on Cllr Carnall’s desk as part of a stunt to demonstrate how little the Tory 3% decrease would save residents. I’d rather have my 5p a week actually then give it to the socialist pigs in the trough at Grafton House. Categories: Budget, Cllr Alasdair Ross, Cllr Carole Jones, Cllr David Ellesmere, Cllr John Carnall, Cllr John Mowles, Cllr Kym Stroet, Cllr Martin Cook, Cllr Tanya Maclure, Ipswich Borough Council, Ipswich Buses | Permalink. After Kevin Algar’s excellent report last time round, I was back on ‘blog roll duty’ this month. The meeting of all Ipswich Borough Councillors in Endeavour House began in a sombre fashion as all sides of the chamber paid tribute to Russell Harsant who died on Tuesday. I still can’t believe I am writing this. My tribute to Russell is here. Cllr John Carnall, Conservative Group Leader, was first to speak and he recalled how Russell always stood up for Ipswich, even if it meant going against the County Council leadership. Cllr Carnall also spoke about Russell’s devotion to the Conservative Party, something I was very familiar with from my time as constituency chairman, and he reminded us how Russell was an aficionado of leaflet delivery organisation! Labour Leader Cllr David Ellesmere said Russell was respected by every councillor, whatever their political colour. Cllr Ellesmere recalled how Russell loved the political process and council chamber debate and how he enjoyed a good point being raised even it was made by the opposition at his own’s party’s expense. This is very true: Russell had time and respect for everyone – friend or foe. 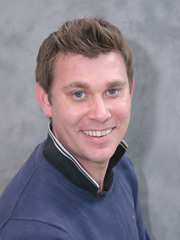 Liberal Democrat Leader Cllr Nigel Cheesman spoke about how Russell was “dapper” and always had a “twinkle in his eye”. 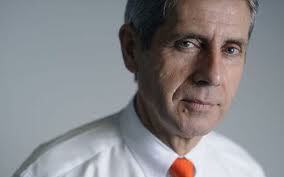 It was clear from the speeches how much Russell meant to his political colleagues and friends. We will dearly miss him. The Mayor then moved on to the evening’s business. Council Questions were up first. Cllr Judy Terry asked Labour Portfolio Holder for Culture and Leisure, Cllr Bryony Rudkin, how negotiations were going with potential Broomhill Pool developers. Not very far was basically the answer. No time-scales were committed for if and when a developer will bring the pool back to its “glory days”. My bet is it will never happen as the business case just doesn’t stack up. Cllr Kym Stroet asked how the town centre fared in the Christmas shopping stakes. Cllr Carole Jones, Economic Development Portfolio Holder, said footfall was up 7% on last year, which is good news! Cllr Stroet then asked a somewhat pointless question about how the council can improve service standards in our town centre shops. Sorry Kym, but what has the council got to do with customer service? We don’t run the shops, even though the Socialists would love to. Cllr John Carnall then swooped in to take a bite at Cllr Jones: “Does Cllr Jones welcome the news Tesco are due to start developing the Grafton Way site in the next few months and does she now regret opposing the planning application, which will create 900 jobs and bring millions of pounds of investment into Ipswich?” Cllr Jones stood up and said no she didn’t welcome the investment and that she “very strongly” opposed the planning application. But then said we are where we are so she does welcome it. Classic anti-enterprise clap trap from a Socialist – I thought she was meant to be in charge of Economic DEVELOPMENT! Cllr Nadia Cenci raised an interesting point that charity ISCRE had received more money from the Council this year than was awarded by the Community Working Group under the last Conservative-led administration. As ISCRE is stacked full of Labour cronies it is hardly surprising Labour portfolio holder for Communities Cllr Sandy Martin found some extra taxpayers money to put their way. Cllr Tanya Maclure raised an important point about the cost of setting up the ill-thought-out Area Committees. Why have Special Responsibility Allowances been handed out to the new chairmen of Area Committees without the Independent Remuneration Committee making a recommendation on the amount paid? Cllr Ellesmere waffled on that the Remuneration Committee will still review SRAs for Area Committee Chairmen but they were entitled to an allowance now under the existing rules. Unfortunately for the Conservative Group, the Labour Leader revealed Deputy Tory Leader Cllr Chris Stewart was the first to take up the additional money. If only Cllr Stewart had been at the Conservative Group meeting on Monday to tell his colleagues that!! Tory Cllr Paul West rounded off the questions by challenging Cllr John Mowles, Portfolio Holder for Housing, on the renovation work at Cumberland Towers, a Council owned block of flats in North West Ipswich. Residents have been complaining of excessive noise, work taking place out of hours, lifts out of order and general mess on the landings. Cllr Mowles said he was aware and that senior officer Joe Howarth had been in touch with the contractor. Cllr West shot back to say this was not good enough and that residents needed a straightforward way of contacting the Council to complain if the works continued to have an unreasonable impact on their lives, such as – shock, horror – a single point of contact! Typically, residents were having to speak with multiple council officers about the same problem in true public sector bureaucratic style. Cllr Mowles promised to tighten up the communication flows. There was then only one report on the main agenda: Council Houses Rent Increase. Labour Cllr Mowles announced rent would increase by 5.6% and blamed the Conservatives for it being necessary. Cllr Carnall retorted by saying it was not necessary to increase housing rents in a recession because the Housing Revenue Account in Ipswich was in surplus! So why does Labour need to put up rents? Perhaps because they are addicted to taking and spending public money! Unfortunately, my Tory friends chose to round off the meeting by deserting their duty to actually vote on behalf of their residents. At the Council Houses Rent Increase vote, Labour naturally voted for it, but instead of voting against the move the Conservatives all abstained despite criticising the increase during the preceding debate. I’ve given my views on abstaining before here so I won’t go on about it again but just to say the electorate don’t elect councillors to NOT represent them. Categories: Cllr Bryony Rudkin, Cllr Carole Jones, Cllr David Ellesmere, Cllr John Carnall, Cllr John Mowles, Cllr Judy Terry, Cllr Kym Stroet, Cllr Tanya Maclure, Full Council meeting, Russell Harsant, Tesco | Permalink.